Roasted cauliflower is so yummy. 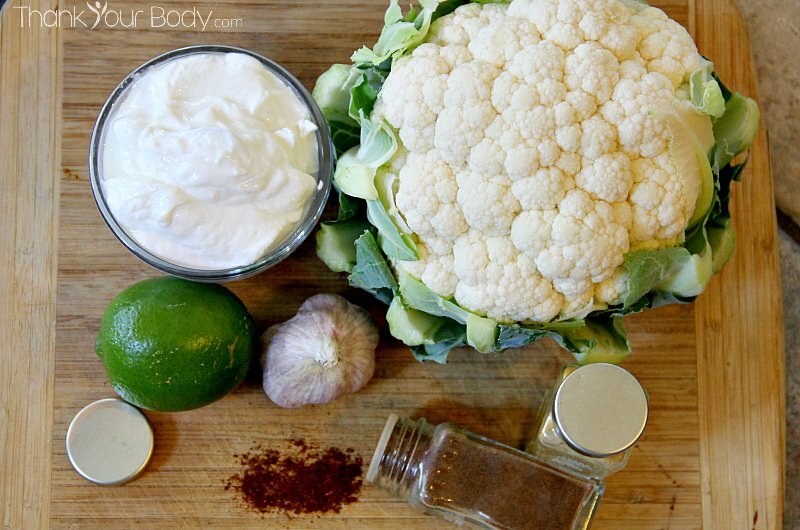 There are so many great recipes out there for cauliflower! It really is one of the most versatile vegetables out there, sort of a super-hero veggie packed with nutrients and able to bring healthy deliciousness to the table in all sorts of creative ways. Blended in your mashed potatoes, cauliflower reduces the amount of starch you’re eating while increasing the vitamins and minerals. One of my favorite feats of cauliflower is cauliflower crust pizza, where this magical vegetable outdoes itself by making it possible to create crispy, savory pizza crust out of a vegetable. Will wonders never end? But cauliflower’s superpower isn’t limited to hiding out in unexpected places, bringing fiber, antioxidants and choline to less fortunate recipe ingredients everywhere. It’s time for cauliflower to stand alone! Let’s celebrate this delicious vegetable with this delicious spicy whole roasted cauliflower recipe! Marinaded in spicy Greek yogurt and browned to caramelized perfection, this whole roasted cauliflower recipe is sure to be a favorite. It’s about time that cauliflower took center stage! Your taste buds will throw a mini parade in its honor when you try this recipe. All kidding (and anthropomorphization of vegetables) aside, cauliflower really is a great vegetable. It’s high in fiber, has 77% of your vitamin C for the day, and fights overgrowth of H-Pylori bacteria in your stomach (one cause of ulcers). It also contains the same cancer-fighting substance as Tumeric, and has anti-inflammatory properties. It has a mild taste, so it makes a great canvas for sauces…and it isn’t overpowering when used in all those “hidden veggie” recipes. I’ve been tempted to try making a cheese sauce out of cauliflower, and then serving the sauce over cauliflower. But I’d never tried roasting a whole head of cauliflower, and I’m really glad that I did. This recipes not only tastes great, it makes a pretty centerpiece for your table and it’s fun to eat! It’s a little bit like cutting a cake…and the kids were excited to try a wedge of vegetable. I must admit to loving the fact that I didn’t have to spend time cutting the cauliflower apart before roasting it…as fancy as it looks, it’s actually easier than roasting cauliflower florets! Another victory for whole roasted cauliflower. You’ll just need a head of organic cauliflower, and for the marinade some Greek yogurt, garlic and spices. Mix the marinade up, and then slather it on the cauliflower. I must admit, this part was really kind of fun! A bit like painting on a vegetable canvas. The whole thing then roasts in the oven at 400 degrees for 30-40 minutes. The only negative thing I’ve read about this recipe is that the yogurt sometimes slips off the cauliflower during baking, so I prepared to brush more marinade on during baking should the need arise. I set a timer and checked periodically. The marinade stayed put just fine for me, but you might want to peek in halfway through baking just in case. The finished product was brown and crispy on the outside, but tender on the inside. So good! It was spicy, so if you are not in the mood for the extra endorphins that come with eating spicy foods you may want to tone it down a bit by using less chili powder (my chili powder was mild…but even so, this turned out spicy). I wanted to make this a meal on its own, so I served it on a bed of lettuce and cucumbers and made a dressing with the leftover marinade…just add a few tablespoons of apple cider vinegar and an bit of raw honey to the yogurt mixture and shake it up. Drizzle it over the cauliflower and salad and enjoy! Roasted cauliflower is so yummy and this spicy whole roasted cauliflower is one of my favorites. Adapted from this recipe. Preheat the oven to 400 degrees. Wash the cauliflower and trim off the green leaves and any woody parts on the stem. Pat the cauliflower dry. Line a baking pan with a piece of parchment paper and set aside. Combine the remaining ingredients in a bowl and mix well. Dunk the cauliflower in the bowl, and use your hands or a brush to cover it evenly with the marinade. Place the cauliflower on the parchment-covered pan and use a brush to cover any empty spots before putting it in the oven. Roast the cauliflower in the oven for 30-40 minutes, until dry and brown all over. If any spots seem to be missing marinade, baste the cauliflower with extra marinade after 10 minutes, repeating as necessary. The marinade will make a crust on the cauliflower. Allow to cool for 10 minutes. Serve on a platter, cutting the cauliflower into wedges. Serve over lettuce and cucumbers with leftover marinade if you'd like, just mix a few tablespoons of apple cider vinegar and a splash of raw honey in with the marinade and drizzle on the vegetables. Are you ready to try this spicy whole roasted cauliflower recipe? I hope so! It’s so delicious. What’s your favorite roasted cauliflower recipe?